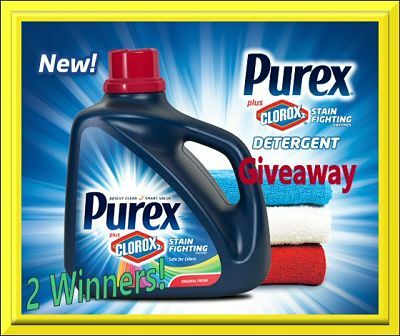 Purex® plus Clorox 2® introduces their best clean available!Purex® plus Clorox 2® combines the bright clean of Purex® detergent with an extra powerful boost of Clorox 2® stain fighters to Work on 100 stains! By following us we are able to get the best giveaways together on the internet! Thanks!Chances of winning depend on entries received. My toughest stain this week is ink on a pillowcase that got washed and dried without pretreating. Yikes! My toughest stains are tomatoe based sauce stains! I have used and liked both Clorox 2 and Purex, but never tried the Purex with Clorox2 in it, that is so convenient and I hope to try it soon. The toughest stain that I had to deal with this week was chocolate. I actually forgot about it, but luckily it came out on it’s own. I really dislike dealing with stains and do not really have any secrets on how to get them out. Most of the time I make more of a mess if I try too hard.